Scope view- LEFT: top of the inner hump. RIGHT: bottom of the tank. I’m now using hot water in each new batch of solution, which I’m changing 2-3 times per day. The anode rod gets cleaned at each refill, and I might swap it for a fresh one soon. The fuzz comes off easily with the garden hose, but the rod itself is getting harder and harder to strip down to bare metal again (unless I use power tools). 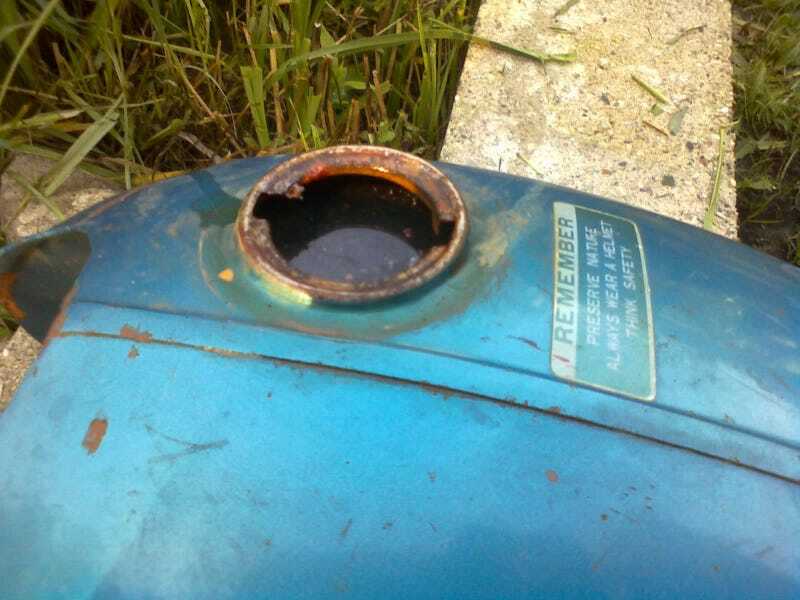 The tank still holds together, and rust removal has not exposed any new leaks. I’m now running the charger at 10 amps full-time, instead of switching it to 2 amps overnight. As for the rest of the fuel system, I’m waiting for the new fuel valve and carburetor rebuild kit to arrive. In the meantime, I’ve been soaking the carb components in Pine-Sol, (thanks for the suggestion, Birddog!) It seems to be doing a great job, but it does discolor certain materials a little. To test out its effectiveness, I placed the float in the bottom of a cup, weighed down by a 1/2" extension. After 24 hours, the remaining crud on the float was easily wiped off, but the brass was now copper-colored. I also started to see some copper color on the stainless extension. Not sure what to make of that, but it doesn’t hurt anything. Unfortunately, wiping the float clean revealed some pinhole leaks in the caps, and I could hear liquid sloshing around inside. So I squeezed it out and tried to get it to draw in some water before taking a torch to it to carefully melt the solder. POP! The caps came off without harm, and I was able to clean them up, solder the holes shut, and re-solder the caps back onto the float. No leaks! I’m now soaking the main body of the carb in Pine-Sol, and it’s slowly bubbling away, even after sitting overnight. I can’t wait to see how it looks later. One of the videos I’m using for reference features an ultrasonic cleaner, so I decided to try one out for myself. The reviews on this Harbor Freight unit are 50/50 great/awful. So after purchase, the first thing I did was take it apart and use some silicone to help seal up the tub better. Once that’s finished curing, I’ll get to try it out. I picked up some of HF’s cleaning powder for the machine, which The powder is supposed to be used at 1/4 teaspoon per “tankful”, but there’s no mention of whether this is in reference to the 2.5L tank on my machine, or the smaller unit HF carries (looks to be about 1/3 capacity of the one I have). Reviews vary wildly, and everyone seems to have their own formula for what solution they like to use. Some of the lower reviews of the machine warn about holes developing in the metal tub, so I feel the need to be very careful about what I pour in there. The manual specifies the use of “lukewarm water” or “approved ultrasonic cleaning fluid”. Huh.